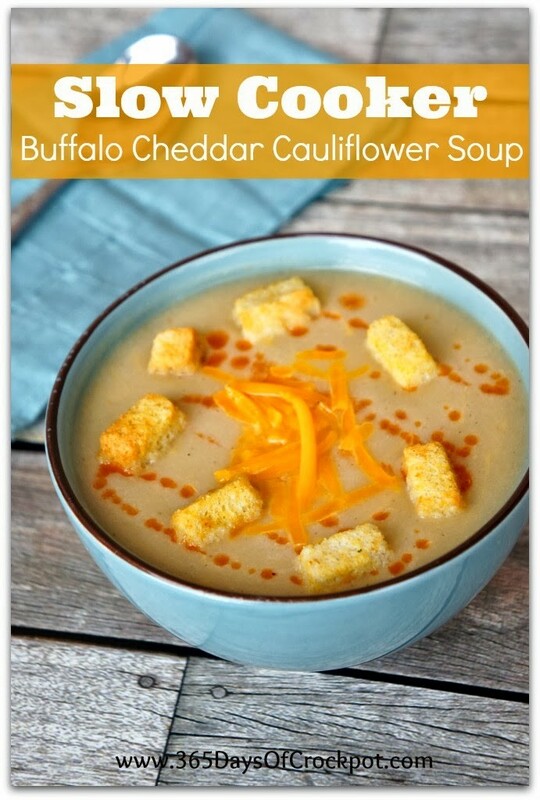 I’ve been seeing all sorts of really great cauliflower recipes lately and decided I needed to join in the fun with a slow cooker soup recipe! This meatless recipe is full of all sorts of flavor thanks to the onion, celery, spices and BUFFALO sauce! It’s also really creamy and comforting thanks to the cheese and pureed cooked cauliflower. When my kids got home from school I was taking pictures of this soup and they literally started fighting over who got to eat the soup…kids, kids we can all enjoy the soup together! There’s enough for everybody!!! I didn’t know if they’d love it but they did and slurped down a bowl each! 1. Combine cauliflower florets, water, bouillon, onion, garlic, celery, thyme, rosemary and bay leaf in the slow cooker. 2. Cover and cook on LOW for about 6-8 hours, or until veggies are very soft. 3. Remove lid and discard the bay leaf. 4. Pour contents of slow cooker into a large blender and blend until smooth (or use an immersion blender right in the slow cooker to blend until creamy and smooth). Pour contents of blender back into the slow cooker. 5. Stir in salt (I used 3/4 tsp of salt but you can use less or more to taste) and pepper and 1 Tbsp hot sauce. Slowly stir in the cheese until melty. 6. Ladle into bowls and sprinkle on more hot sauce to taste. Top with a tablespoon of cheese and croutons. Eat and enjoy! Cauliflower comes in all sizes – about how many cups of florets? 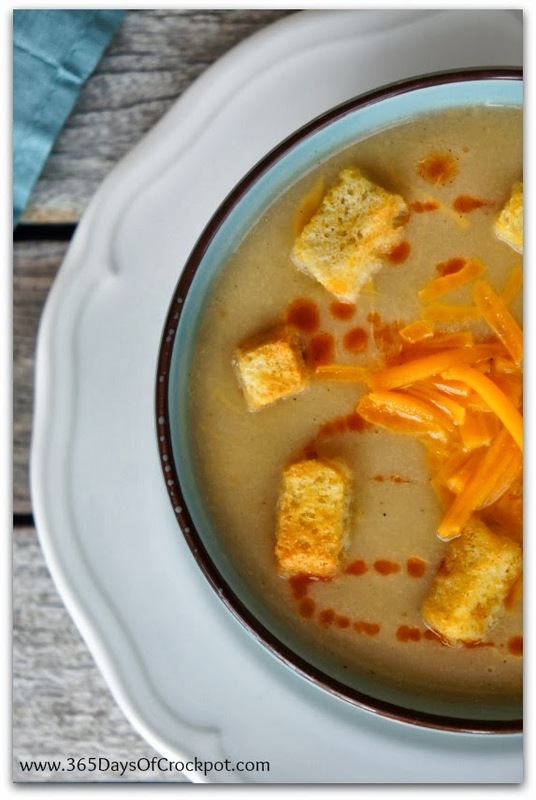 This looks so creamy and yummy, perfect for these cooler nights of this chilly spring! I just made this. I follow directions exactly. My vegetables were all done at 2 hours on low. Must have been my cooker. Wizzed with a stick blender and done. Tastes like a nice cream of cauliflower with cheese. Wow this looks delicious! I had to pin it for later!! It is! Hope you like it! This looks yummy. I can't wait to try it!